Back In The U.S.S.R. - Banned? - Soviet-Empire.com U.S.S.R.
Back In The U.S.S.R. - Banned? Maiakovsky example of socialism realism ? Can you show me any unbiased source to back that ? While I could go on all day with my criticisms of Stalin, and Mayakovsky wasn't exactly pro-Stalin either, the bulk of his oppression did come from ultra-dogmatic party bureaucrats in the Russian Association of Proletarian Writers (or RAPP) who did things like restrict art that didn't promote one policy objective or another (five-year plans for example). He was ignored not because he was an avant-garde futurist, but because he was a "formalist" and thus supposedly "un-progressive." It was pretty much the opposite of the kind of critique Stalin would have made of someone, with his romantic-realist tastes. Stalin himself actually praised Mayakovsky's work: "Mayakovsky is still the best and the most talented poet of our Soviet epoch. Indifference to his cultural heritage is a crime." He later closed up the RAPP, replacing it with the Union of Writers. That was centrally controlled by Stalin and the Soviet state, and that's where the mandated socialist realism started, after Mayakovsky's death. It became mandated state policy in 1934, Mayakovsky died in 1930. But it was still easily less repressive than the RAPP's policies, which were less "abstract art is restricted" and more "any art which doesn't serve our immediate goals is restricted," and Ismail is right that Mayakovsky's work was a big influence on later socialist realist poetry so he could be seen as a proto-socialist realist. Tellingly, if you look at Mayakovsky's Wikipedia page (yes, anyone can edit it, but the page is skewed way more anti-Stalin than anything), he's listed as a socialist realist writer. The roots of it in writing were generally seen as in a trinity of Gorky, Sholokhov, and Mayakovsky. Well, actually i used Maiakovsky just as example. I wasnt intending to discuss about him specifically, but about the way most communist parties ignorantly treated art as an instrument that could be planned etc. We simply can't hold art, its like trying to hold water. At best, during the revolution and the possible war comunism that would result from a revolution, we can supress burgeoise art (not generic art, but engaged art that fights in the camp of capitalism), but its childish to think that we can reach such a level of control over society as to simply eliminate art that is not directed towards party goals. People will always find a way to express their feelings. There we actually agree. I think the state should express itself through realistic art that the average person can more readily understand, and as a style of romantic-realism rather than naturalism that just copies the real world, socialist realism was a great style for uplifting the masses along with it. But I'd never support banning a particular style of art. Abstraction and subjectivity are needed to express some things too, like pure unfiltered ideas as in constructivism or a full picture of perspective as in impressionism. And if you force a certain style of art on artists more broadly, it'll just come off as hollow and passionless, defeating any uplifting purpose it might have. Plus, I think the people who want to ban abstract art just have their view on it backwards. Yeah, if abstract art predominates it says artists want to get away from the real world, but that doesn't mean it's creating alienation and an unhealthy society. It's a symptom and expression of it. Fixing the problems that breed that alienation is what Marxism intends to do. Socialist Realism was a huge bust. 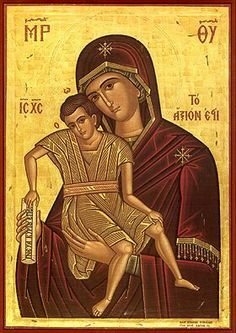 Nothing but Orthodox iconography in "secular" form. One of the worst decisions ever made. Hey, not all of it was that ridiculously boring, still, and lifeless. But a lot of it really was, maybe even most of it, and I'd blame that on the mandate more than anything. Because you need to see with better eyes. The "saints" pictured in the orthodox iconography represent an idealized man, for that time period, something that everyone was supposed to strive to be. The "workers" pictured in the socialist realism, are like the "saints" of the former, in the sense that they are idealized models, not real human kinds. They are the "saints" of the stalinist socialism, something that the everyday people is supposed to strive to be. 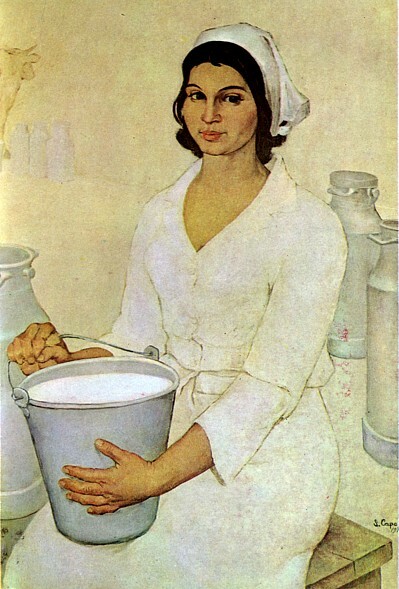 As a side note you can see in the socialist realism that there is no internal struggle. There can be struggle, but it is externalized against class traitors, burgeoise etc. You dont see the tormented artist, you dont see the man lead to his extremes in order to know itself individualy etc. There are simple, childish, stereotypes of people and what is expected from them. Is this trully art or propaganda ? 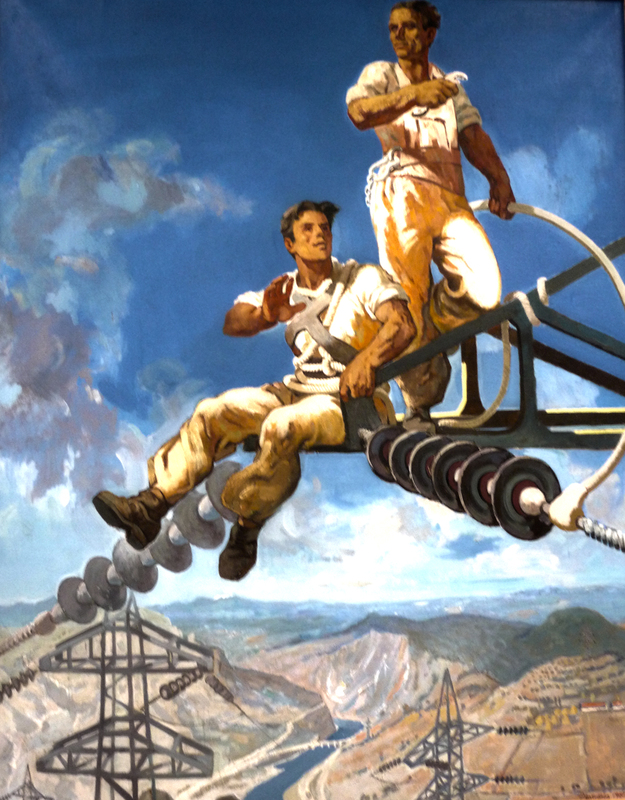 I don't think the idealization of the workers is really the problem most people (including me) have with the usual socialist realist art. It's a form of romantic-realism, it's supposed to be something to strive towards, something to uplift people. Just like the hero of a story is usually someone with qualities we try to emulate, someone who pushes us to improve. Teaching lessons has always been and presumably always will be part of the point of forms of art, all the way back to Homer. That's easily defensible, and definitely a good thing in my opinion. The big problem most people have with it is just that a lot of it is so hollow, rigid, and formulaic. Like it's the same generic freeze-dry stuff over and over, with no real passion seemingly put into it. Like it was drawn just to fit an official mold, even if it just bores the onlooker to tears because nothing seems to be happening in it, it seems to say nothing other than "look at these workers here," and they've seen basically the same thing ten thousand times before. I seriously can't believe I'm defending this, but yeah, it's art by definition. It conveys a message that speaks to people emotionally. The idea that art can and should only be about internal struggles strikes me as a pretty bourgeois, individualistic, and even outright solipsistic one. That's a topic worth exploring, and that's been explored ad nauseum, but it's far from the only thing art can focus on. And art can easily be about an external struggle; it often is. Or is The Iliad, a story about war first and foremost, not art to you? Romance of the Three Kingdoms, a story about politics? For a modern example, The Grapes of Wrath, a family's struggle against poverty? Even some things that seemingly are just about internal struggles have an external element, because we're all influenced by the world around us. Franz Kafka's novels, which are all about his depression and inner torment, also often include very thinly-veiled reflections on his problems with his overbearing father for example. What i said is that it LACKS internal struggle. I am not saying that art MUST BE all about internal struggle. I am just point something that lacks, and that i believe is the root cause of shallowness. PS. : The hero in romantic prose usually follows a self-discovery path at the same time that he struggles against outside elements. He actualizes himself. Even on th Illiad we have internal struggle. The Greek poet presents greece as a decadent materialistic society that happens to be materially more powerfull than the Troy society, wich is way more conservative in values (like family values etc). I believe this has to do with the collapse of the genus system and the introduction of private property in greek society (or something like that). I am not well versed in art to discuss. But there is internal struggle in the Illiad. Socialist realism is limited to something like : "Do your work comrad, the revolution was sucessfull, now we need that you dont question the government authority and work hard, forgetting about yourself." Man becomes shallow because of this attitude. On another side note, whats wrong about individualism in a socialist society ? The uttmost form of individualism (the smart one) leads us to want good for others (because life as men enemy of men is impossible). Its the fear that leads to opression. And that fear shows itself in any society that ignores it, even a socialist one. One of the ways to deal with fear is art. Yet, on a shallow art as socialist realism, theres no space for fear, theres no space for the unknow, theres no space for the other. All are equal, as if this was humanely possible. We cannot even be materially equal, worse being subjectively equal. Sure, I'm a big fan of Romantic prose actually; I'd even consider Shelley my favorite writer. But we identify with that Romantic hero because he's trying to be greater than he is. He's trying to live up to figures even more heroic than he is, better exemplars of what we think a human should be. So, even that art needs art about ideals of what we should be to even make sense. Or, to quote an amazingly dorky song that I was just listening to: "Be dark, be cold, so conflicted. No hand to hold, heart constricted. Dark knight, bright soul, we're addicted. No room here for the bold. 'Cause no one wants to know the man who stands for things we outgrow, he's too noble and too blind. We're all older now and we don't need someone to care about the innocence we left behind." Sure, that's the unfortunate subtext of a lot of it. But my point is that's a problem of reinforcing the same generic message over and over, not a problem of just presenting idealized humans. Presenting idealized and dramatized people in one form or another is just what art does, unless it's strictly naturalistic art. And I don't understand the point of that, just go outside and talk to people. Its the fear that leads to opression. And that fear shows itself in any society that ignores it, even a socialist one. One of the ways to deal with fear is art. I was using "individualism" in the sense of solipsism. Focusing just on looking inward to find the source of your problems when the source of them, more often than not, is more outward. Because we're all creatures of society, and even if we get a temporary respite from them personally, only altering that can fully end those problems. Yet, on a shallow art as socialist realism, theres no space for fear, theres no space for the unknow, theres no space for the other. All are equal, as if this was humanely possible. We cannot even be materially equal, worse being subjectively equal. Again, that's kind of the point. It's intended to show society as it should be, without things like fear, thus encouraging people to overcome their fears. There was room for self-criticism too, to challenge problems Soviet society still had, but one has to be very careful about that. Since, as was shown in a lot of the films of the perestroika era, there's a thin line between constructive criticism and actively praising a reactionary system over your own. A thin line between curing your headache with some rest, and curing it with a shotgun to the head. Presenting idealized and dramatized people in one form or another is just what art does, unless it's strictly naturalistic art. As idealized i was saying people without defects, without fear, without "unwillingness", and all little (or big) defects that makes us humans. Art presents humans not as perfect people (some styles of art do) but as perfect examples of people. Art must be "universal" in the sense that someone reading or looking (or whatever media) art, identifies with it. (It would be very strange to see alien styles of art). 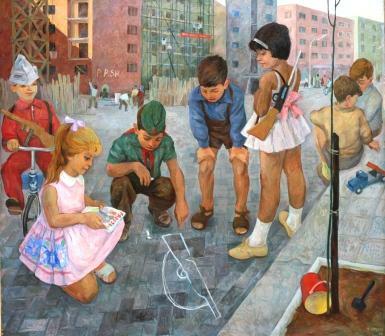 So, coming back to socialist realism : Proletariat is always perfect. Burgoise is full of defects. This is a side effect of that problem at the start of the discussion, art was used to educate the illiterate proletariat and peasantry of URSS. So socialist realism is a downgrade (dont know a better word) of art to match the public. And avant gard art like mayakovsky and others used to do during the revolutionary period was refrained upon because it was considered too complex or too elitist. Well, reading again maiakovsky i see that his verses are not hard to understand. He is much more realist than burgoise poetry. He's very down to earth. I forgot how much i love his easy poetry, how he puts love right here and there. You can work at the factory, have a mediocre life, but you still love, love is quite democratic in that sense, and Maiakovsky is pretty acessible to the masses. Regarding that part were you said that people idealized in art without fear makes common people overcome their fears, i believe its the other way around. While you think that your problems are unique, exclusive to yourself, your burden is unbearable. But, if art shows you that you are not alone in your problems, you can share the weight with others. Thats how you can overcome it, i believe. Idealized people (perfect people) makes you shun even more, forgetting yourself in the sea of the masses, were everyone tries to show a facade of perfection. That way socialist realism approaches modern advertisement, where people are, too, shown as perfect (perfect while they consume a certain product, as if their perfectness was produced by the product being shown). And what I'm saying is that some art does need to portray that. They may not be the most identifiable figures, but the figures who we do identify with are so because they don't quite live up to those ideals we're all trying to reach. If a state is trying to convey itself, should it portray the flaws of its own people? Of course not, it should encourage them to something higher. It as an organ should be the hand helping to lift them up. Leave the conflict for the individual artist, working outside of the state. And even then, some will portray their vision of perfection all the same, and that's fine too. Yeah, it's true that art was used by the Soviet state to convey messages to illiterate masses of people. And even today it's used more subtly to convey messages, whether to dress up an advertisement or in the form of advocacy for something within art. Like 24 and Tom Clancy novels being de facto tools of the American state, even if unintentionally. Mayakovsky wasn't exactly someone whose work would be considered elitist or hard to understand, as long as it could be read. He was avant-garde and experimental in a technical sense, but very much a realist. I didn't say it would make them overcome their fears, that requires outside support too. And recognizing that others share it can play a role in that, definitely. Without that support, they'll feel alienated. What I said was that it gives them an example to strive towards. Without that example of someone who's conquered it, the fear is seen as just a fact of life and unconquerable. That's why you need both the idealized picture, the one who shows it can be conquered, and the person struggling alongside you, who shows that you're not alone. That's where both those who want to repress art (like those who mandated socialist realism) and those who take just a solipsistic "true art is angsty" view of it (like a lot of modern society) are both wrong. Artists expressing themselves will provide the latter, it's not often positive emotions that mainly attract them to art, but I'd say the state should express itself more with the former. That one made me laugh out loud and startle my cat. The mighty Albanian Navy, proudly flying the flag of the, err, Byzantine Empire, some 500 years after its final defeat. On a side note, I'm a huge fan of Byzantine history. Αιώνια δόξα στους κληρονόμους του Κωνσταντίνου και του Ιουστινιανού. Ζήτω η Ρωμαϊκή Αυτοκρατορία! The eagle was used by Skanderbeg's forces, hence why it's the flag of Albania.